Bill Brack is another Canadian racer who drove a 59/69 to the first Formula Atlantic Championship. I met him the first time I raced at Mosport - probably my favorite track. He had just finished restoring his car and was debuting it at the event. i was still very much the neophyte as I introduced myself and chatted with him about Lotus. He was kind enough to give me a few promotional card depicting him and his Lotus from the period when he won the FAtl Championship, and autographed one of them. Fast Forward a number of years and I am back at Mosport, this time with my 69. I chatted him up again and told him that I now had a 69 too. He was polite enough, but I got the idea he looked at me as just another hanger on, which I suppose was reasonable enough, because I pretty much was. That is until I put the car on pole, then his interaction subtly changed to that of a peer. It was then I really felt like a racing driver. I subsequently won a hard fought race aginst some stiff competition. All the more meaningfull when Bill came over to me afterward to congratulate me and tell me how his entire team stood inside of turn one cheering me on each lap. We discussed the merits of the chassis and class, and he told me from his perspective, and keep in mind he drove for Team Lotus in the Type 49 and drove just about every other open wheel class, he felt the 70's era wing and slick cars in FAtl/F2 spec are about the most fun you can have. The combination of power to weight, mechanical and aerodynamic grip make the perfect drivers cars. I don't have the wealth of experience he does, but I'd have to concur. Framed magazine cover and article feauring my 69 in acquired livery - with my old driving suit and helmet that Alan (Cornbeef) refers to as the Kyle Stig. Original 69 FB rear wing hanging above Barn entry door. I still kick myself for simply not acting on an ebay listing of about 4 years ago: One of the wheels the style used on the Lotus 38 and Lotus 30/40, among other cars, came up for auction on ebay. I believe it wound up selling for $100 bucks. Don't know exactly what I wouldv'e done with the wheel, but I wish I'd bought it. Wonderful stories, Kyle. I love them. In no way my 'history' can compete with yours (I never drove races) but like so many of us on this forum I have been addicted to motor racing for as long as I can think, and in case of 'silver-aged' people this is quite some time. Born and still living close to the Nürbugring this track was my favorite target, of course. I have posted this picture before. You can see me on the left with (in that year) reigning World Champion Denny Hulme and Joakim Bonnier in the Paddock of the Nürburgring - one of the very few buildings there that have survived all the modifications in all those years. Date: Saturday, August 3rd, 1968. Wonderful photo Michael. Hulme looks like he had a bad day, Bonnier looks like he's happy about Hulmes day. You looked awed to be in their presence. Nice. Very nice. I made use of my library when Lotus limited did a Lotus trivia contest this past Christmas. I won this Caldersmith print, supplied by Coterie Press - publishers of The Lotus Book. Goes to show the thousands of dollars I spent on Lotus books and hundreds of hours I've spent reading them paid off. I have so many images featuring Lotus, I now limit what I might consider buying, though anything being given away for free is still welcome. When I do decide to buy I either look for objects of historic value, or images that have a unique appearance. I like this image because it has an artistic quality that is not stricktly representational, it depicts the Lotus 34 - a Type not usually found Lotus art, it contrasts the new wave of Indy car (Lotus 34) with the old (Watson Roadster) and neither subject is directly centered in the image. This print was commissioned by the Indianapolis Motor Speedway as part of a celebration of their history. Alittle over 2 years ago the new house was ready to be moved into and on Memorial Day weekend 2007 my wife and I moved into our new home. The Barn was not completed to the extent that I eventually planned on, but it had reached the stage that was envisioned for that time frame. That is, the structure was done and weather proof, there was rudimentary lighting, and the bathroom was finished and functional, but the ceiling and walls were not complete, there was no insulation, and most importantly, the heating system was not in. But I now considered my self ready to acquire Lotus that were not race cars and were not going to be stored in a Race prep shop. I had not yet really considered adding to my collection when my wife dropped the bomb on me the she was pregnant! My immediate response was "I'm getting another Lotus". In the mid 60's Chapman saw that many of his original customers were getting to the stage in their life where they were having families and some were being forced to cutail their Lotusing because of the limitations of 2 seaters. Subsequently the M50 project was initiated and the Elan Plus 2 developed. So just like Lotus' customers back then, I too found myself in need of more than 2 seats. I set about looking for something that the child could ride in along with it's parents. The choices - in the US - were the Cortina (which I highly covet, but they are very pricey for one in excellent condition), the Elan Plus2, and the 70's era Elite/Eclat (which are not particularly collectable and suffer from some degree of disdain amongst even the Lotus faithful, but to me have a certain [I]elan[I]and eclat that I very seriously considered them. In the end I decided on and bought this beautiful RHD Elan Plus2S 130/5. It is the climax of Plus 2 development, and represents to me the last and end of the classic era of Lotusing. Last edited by lotus69f2; 09-04-2009 at 04:53 AM. As is often the case in car collecting one persons loss is another persons gain. I bought this car from a general automitive enthusiast who lives in Queens. He told me when he saw the car advertised for sale he immediately fell in live with it's shape and had to have it. He bought it from Paul Matty Sportscars in the UK and then imported it and had some service work done on it. By the time he paid for all of that he a twice as much money into it as it was worth, then was unfortunate to develope a medical condition that precluded him from enjoying it so he reluctantly put it up for sale and sold it for a fraction of his cost. The day I bought it the poor fellow has spent the previous night inthe ER getting treated for his condition and arrived late to the garage where it was stored. When we brought it out into the sun and open air all he could do was stare at it and remark over and over about how beautiful it is. I really felt bad about rushing him to part with it but I had already driven through NYC to pick it up and was going to spend a few hour in bumper to bumper traffic pulling a trailer with a manual transmission truck so I loaded her and got on my way. I have to say he is right. Aside from the original Elite, I think the Plus 2 is the most attractive car Lotus has ever produced. Especially the rear, in which I can see some similarities to the Evora. I'm looking forward to seeing them side by side. Yes, I have mentioned and you probably noticed it is right hand drive. I am no stranger to RHD drive as the Six is also that specification. THe Plus 2 being larger and enclosed takes a little more getting used to than the Six, but it is really no problem to drive on LHD roads in the US, and driving on the highway - where it'll cruise all day at 70mph - easy especially in the left hand lane. Colin was born Feb 1, 2009. He has sat, but not yet ridden in most of the cars. I'm really looking forward to the time when he is old enough to play with cars like his dad. Goes to show the thousands of dollars I spent on Lotus books and hundreds of hours I've spent reading them paid off. Where and when will you be installing a refrigerator? The refrigerator is low on the priority list behind the flat screen TV. When it arrives it will like go either in the service area or near the bathroom, which seems more appropriate considering what will be it the fridge. Thank God as I was getting a bit worried about you there amigo! 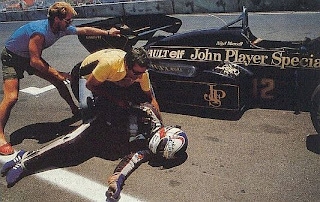 Having a photo framed this week of Nigel Mansell passing out while attempting to push his Lotus 95T across the finish line of the 1984 Dallas Grand Prix... one of the hottest in history. Damn that was a miserable 104 F day in Texas! I won't go with the kegerator. While I love beer, I don't drink it in enough volume to justify the keg. I prefer English ales and microwbrews so I'll likely have a small fridge stocked with those. My first race mecahanic and mentor Bill Dolson received a shipment of parts from England. In it was a flat piece of metal painted black with yellow pinstriping and the word Goodyear. The story was, it was hanging in a pub somewhere in England and Bill's friend Simon convinced the owner that he should give it up, which he amazingly did. It was duly transferred to Bill, then gifted to me. It is a rear wing end plate off of a Lotus Type 77 F1. Note various slots and holes to adjust wing elements for downforce. The graphics are all hand painted. Agree with you there on the Kegerator hombre! Fridge is more than fine as I drink the same stuff. Mansell pushed his vehicle or attempted to push his vehicle across the finsh line to gain a point. Believe he came in 6th that day. My photo is of him pushing his Lotus and not of him collapsed like this below. Nigel has always been one of my favorite drivers. On that day many of the fans parked all over the Texas State Fair Grounds on grass lots. You read right... where the Cotton Bowl is located. During the race about three cars went up in smoke because their catalytic converters ignited the grasses underneath them. ...wow - what an amazing find!.. My older brother called me one day and told me he was considering buying an Elise. This was when the '05's had just come out. I knew a dozen or so people who wanted one and they were all waitng for the factory to build them. All had put in orders and many had to wait an additional 6 months from the time my brother inquired. I told him as much and also related how excited Iwas that he was joining the ranks of the Lotus Eaters. I told him the local dealer was Rothrock, and how to get there, and suggested it would be a good idea to visit and ask about ordering one. A week later he called me again to tell me he had just bought one. Arctic Silver, Sport and Touring, hard top. Fully loaded. Apparently dealers order their own, fully loaded for maximum profit and they actually had cars on the lot ready to sell to those who didn't want to wait. A year or so later he called me again to tell me he had just bought a Ford GT. Very cool I thought as I panicked about the fate of the Elise. He was keeping it and would share his 2 car garage with the GT. I'm a Lotus man through and through, but let me take a moment to tell you about the GT. His is Black with no stripes. Presented this way it looks really, really menacing. When I drove it I found it to be fairly easy to drive, but it is a very big car and visibility is not great, but not bad either so around the neighborhood it is a bit ponderous. As I stopped at a light to make a turn so we could make our way to the Interstate, I inadvertantly put it in third gear. No problems pulling out. Great clutch, gobs of torque. When we got to a certain section of the Interstate he told me I could open it up and goes as fast as I wanter (or traffic allowed). The road was very straight and no place for the police to hide. As I arrived at the spot I was in 3rd gear and going about 55mph. I stomped on the throttle and quickly accelerated to 130mph with out shifting before I backed off and brought her back down to reality. The Ford Gt comes with a 6 speed gearbox, but you only need 3rd. But I digress. He has since purchased a new Ford Shelby Mustang GT500 convertable so the expected quandry of which car to sell, or store outside, or store elsewhere came up. I offered right away to keep the Elise for him. He accepted and as of Easter 2009 she'd been in the Barn. Not my car, but part of the stable. At least for now. Last edited by lotus69f2; 07-17-2009 at 03:45 AM. When Team Lotus picked up sponsorship from Gold Leaf cigarettes it wasn't just for F1. Imperial Tobacco's Gold Leaf brand also supported Lotus in many forms of racing. To celebrate they produced a number of prints that were available as a set. They came with a small card that describes the scenes and has a small cut off that could be clipped and sent in with a few quid for some custom frames. I acquired my set at LOG from the only UK denizen to make the annual pilgrimage to LOG year after year Gordon Morris. I am quite happy with the presentation. It is one of my favorite displays in the Barn. BTW- maybe I missed it in the beginning but is your floor coated with anything? The floor is a grey epoxy paint. It looks OK in the pictures, but there are tire marks and oil stains on it already. Worst of all is that I did an emergency brake job on my Hoda Civic when the emergency brake froze (the Barn by the way was not yet heated. There was brake dust all over the place and I tried to clean it up with Brake Klean only to find it melts the expoxy paint so now I have a big spot with brake dust rubbed into the paint. I thought epoxy paint was supposed to be really good for a garage, but I am finding out it isn't. I have seen some really expensive professional floors in race prep shops (like Penske's old shop in Reading), but I'm afraid the price is too steep for me.